It’s the most wonderful time of the year! One of my favorite posts is our annual Scootadoot Chick Secret Santa post. We just love each other, a lot, and we love you guys a lot, and we loving sharing with you how much we love each other, and you. I promise, I have not been dipping into the spiked eggnog. Yet. I’m just pretty grateful for the wonderful people in my life, these ladies and all of you included. After waiting with bated breath to see whose name I would draw for our little exchange, I was super excited to get Jess! (I would have been excited to get any one of these ladies, let’s be honest, I love them all!) Though Jess and I have never met (womp), it seems pretty clear that we’d get along smashingly. I mean, she loves Beyonce. That’s kind of the basis for all solid relationships, amirite? Anyways. When I drew Jess’ name, I hemmed and hawed for a while deciding what to give her – she’s a stylish chick, so I knew I wanted to find something to complement that. She’s also active – if she’s not running, she’s taking care of her totes adorbs little one. Whatever I got needed to fit that kind of lifestyle. 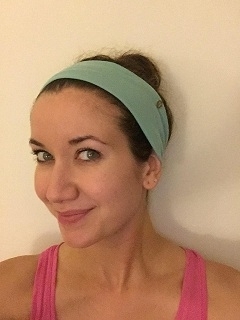 I ended up finding a pretty and functional headband. It’s great for the working out (sweat-wicking!) and fun for the fashion-forward (multi-style!). One could wear it while running. Or while enjoying a lazy weekend. Or, my favorite, while going hard in the “athleisure” paint. Functional fashion at its finest! It’s our third year of Scoot a Doot Secret Santa and I have yet to get the same person twice! Is that a record? I’m not sure! But I do have to say that I was pretty stoked to be paired with the lovely, talented, and gosh-darn awesome CAMILLE! Cam is my ride-or-die chick and I always know that when we are together we are basically going to have fun, no matter when we stumble across. This year she came to visit in the spring and we (Jenn, Cam, and myself) took to the streets of Philly for a walking tour. I had SO. MUCH. FUN. with them. I still giggle when I think about how excited Cam was when she spotted someone walking around with Yuengling (because it’s hard to find in CA! Who knew?). When I found the trivet that covered a few of the places we visited, I knew it would be a great gift for Cam and make her smile. There are so many places on there that we haven’t visited yet, so she’s just going to have to come back! I was matched with Kyle this year. I love everything about this chickadee and wanted to get her something that proved useful (but pretty) for a multisport athlete – – runner, footgolfer, basketball diva. 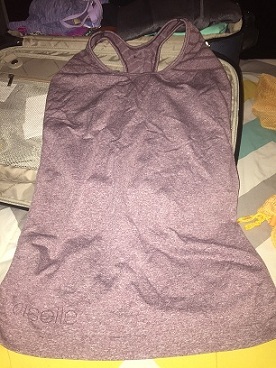 So I got her an Oiselle tank. I knew she loved their clothes since she borrowed some of mine on a few occasions and has some great pieces of her own. Happy holidays! 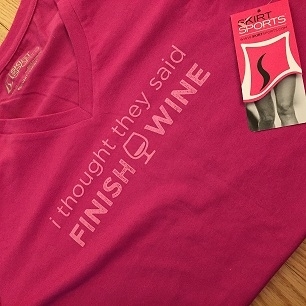 At a recent trip to the SkirtSports headquarters, I spotted this shirt and thought of Meri. I can hear her voice saying it as if she coined the phrase herself. And hey, we can all relate, right? I think we can all agree there should always be adult beverages at the finish line. Never mind if it’s 8:30 in the morning. 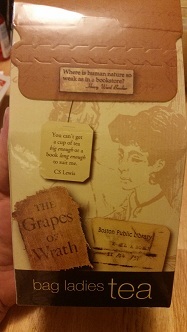 I gifted Bec with tea that has literary quotes on each bag. It blends two of her favorite things – tea and words (the second of which we bonded over to begin with). I hope it keeps you cozy and well-read, my dear! My secret Santa this year was the lovely Vic. I knew immediately I wanted to get her something kitty related. I also know that Vic shares my love of baking. So I went out searching for cat baking supplies. Yes, that phrase is now in my Google history. 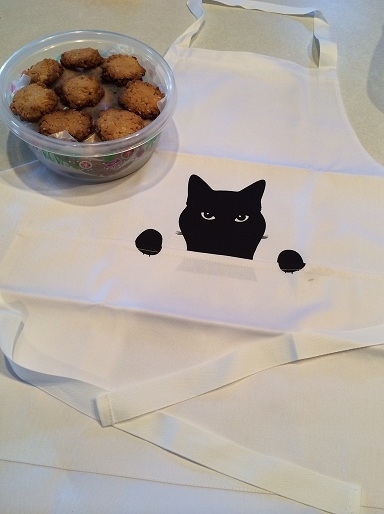 I found lots of fun stuff and it was really hard to decide, but I knew the apron was the winner as soon as I saw it. I can’t wait to see what treats Vic cooks up in this apron! Merry Christmas, my love! Just like Mer, I’ve yet to get the same chick twice, and I was thrilled when my match this year was Jenn. I love this girl like crazy, and just want her to come back to my kitchen and hang out. Jenn’s loves include classic cinema (we’ve co-swooned over Montgomery Clift), Star Wars AND Trek, yoga and her pugs. I figured if I could incorporate at least two, I’d be happy. 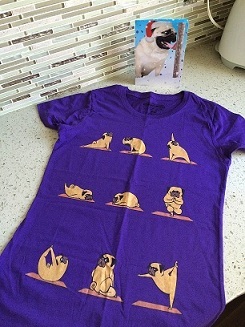 So when I spotted this pug yoga shirt, I knew this would be the perfect gift for Jenn. Wear it in good health, love, and try not to let the pups knock you over! From our little Scoot family to yours, the happiest of holiday wishes! XOXO (Cool points if you just said ‘Gossip Girl’ in your head. 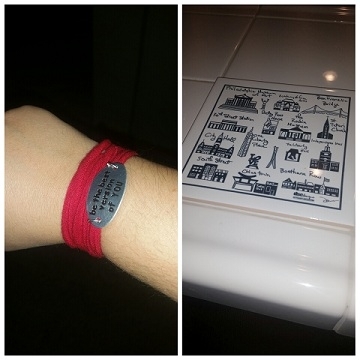 This entry was posted in Fun stuff and tagged chick chat, Secret Santa. Bookmark the permalink. ← Holiday PRO Compression giveaway!